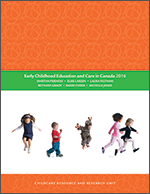 At the end of the twentieth century, early childhood education, child care and family support services are unevenly scattered across the Canadian early childhood landscape. Does this makes sense? Could there be one integrated approach to children's programs within a coherent policy framework? Should there be? This paper takes the position that a blended, coherent system of early child development programs incorporating child care, early childhood education and family support services should be available in every community. It examines the current array of policies and programs and considers options for developing the proposed system of early child development programs.